Endings happen. Sometimes slowly and after a long slide or decline. Sometimes suddenly. My friend, Mary, and her husband Craig lost both of Mary’s parents within the last year–her father after a lingering illness several months ago, and her mother, who was 75 and fully engaged in life, found dead not far from the campground while on a camping trip with Mary and Craig a few weeks ago. Also, today is the one-year anniversary of the death of my father, Deane Gunderson, who graduated from Rolfe in 1935 and was 91 years old. My mother, Marion Gunderson, died in 2004 at the age of 85. An anniversary of a death can trigger poignant feelings, prompt a reassessment of priorities, and add extra layers of meaning to current events. Last week, while a friend, Shelli, and I worked in my garden, we noticed that Lacy, a third chicken in my flock of five laying hens that I had gotten two years ago, looked like she was going to die. 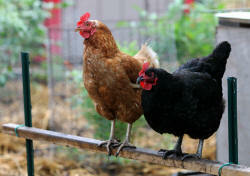 Goldie, a Buff Orpinton, had died last year, and Rita Jane, a Rhode Island Red, had died just weeks ago. Goldie’s death threw me into deep grief. Yes, she was "only" a chicken, but having pets was something new for me in recent years, and she was the first of my chickens and cats to die. I took Rita Jane’s death more matter of factly. Lacy stood still in the shadow of the cherry tree, apart from the other chickens for long periods of time. The area around her neck and head was bloated, and her eyelids were falling shut. I called friends for advice, knowing basically that there was little I could do–no taking her to a veterinarian. I did wonder about euthanasia and even called a neighbor I know who reduces the rabbit population in her yard with a pellet gun. But shooting a chicken, who appeared to be dying a slow death, was not appealing to either Joan or me. Fortunately, a week later, Lacy seems to be doing fine. But it took awhile for her to recover, and initially, I was worried and didn’t want her to die feeling unloved. While I was gardening alone later that night after we had noticed Lacy’s symptoms, and she was not far from the chicken hotel where she would roost that night (if she lived), I occasionally walked over, picked her up, cradled her, and talked sweetly to her. My grief was for her. My grief was also in relation to vivid memories of a year ago when I watched my father in his bed in the intensive care unit at Mary Greeley Hospital here in Ames. He was neither in a coma nor very alert. It was hard to know what he understood, and we had a hard time understanding what he struggled to say. I sat close and held his hands, which were large like a person would expect a 91-year-old farmer to have, but I was surprised by how soft they felt. I leaned toward his ear and said, "Your hands are soft." Soon he began chirping, "Soft hands" and chuckling, repeating the phrase followed by a chuckle often that evening. I was grateful that my close friend, Joy, could accompany me on one of my visits to see Dad at the hospital. He had been fond of her and often had lunch conversations with her at the Red Lobster Restaurant near the bank where she works in Ames. Sometimes he asked about her insights into Christianity. In his last months of life, he had recurring nightmares of a war within himself. It is quite possible that he was recalling an eighth-grade Sunday school class in which the teacher had said a person would go to Hell if he did not believe the Bible in her prescribed way. I recall Dad being a man whose church involvement was that of good works and ethics rather than discussing faith or feelings. I never heard him pray or talk about praying. I doubt that he believed literally in the Bible, but many of his offspring are conservative Christians. Some of his long-time, close friends are also conservative Christians. Sometimes a person regresses as he or she ages and death looms larger than ever before. In his last years, it was as though Dad was an adolescent, relearning about Christianity and trying to come to terms with the threat of his Sunday school teacher. Dad was an avid reader and even began reading the Bible in his last years. He also asked my older sister, Clara, who had been a high school librarian and his reference librarian, for books about Christianity. Although I have a Presbyterian seminary degree, and he and I have had a few discussions about religion, he did not let what I said sink in, nor did he ask me for a reading list, even though he was probably an agnostic. I recall suggesting that whatever he believed should be true to who he was and there were many ways of understanding who Jesus was without believing in popular formulas. I also told Dad that Leo, a friend in his 50s who runs a computer business in nearby Pocahontas and that Dad appreciated, was leading a progressive adult Bible study class at the Methodist Church there. I suggested to Dad that he might like to join the class, considering that others of his acquaintances from Poky were participating in it. Interestingly that church is much more handicap accessible than the Rolfe Shared Ministry, which uses the former Methodist church with its many, challenging steps. I certainly wish Dad could have been exposed to the kinds of information presented in the DVD discussion course called Saving Jesus that I took this past spring at the Unitarian Universalist Fellowship of Ames. Although Joy is an evangelical Christian, whose father was an evangelical pastor, she has never pushed religion, but has been extremely gracious. Indeed, she is an example of the fruit of the Spirit growing from a person's religious beliefs and disciplines. She brought her Bible to Dad's hospital room, and after standing near the foot of his bed and visiting awhile, calmly told him that she had some passages that she wanted to share. Then she read the 23rd Psalm and John 14, "My Father's house has many rooms ..." My feelings are tender as I recall how beautiful it was to hear her voice reading the words of the Psalmist. In contrast, I have been told by a reliable source, that one of Dad's long-time, conservative friends sat himself close to Dad's hospital bed, leaned up to Dad's ear, and loudly said something to the effect, "Deane, there is a time to get down on the knees and accept Jesus. Have you been there? Have you accepted him?" According to the source, Dad sort of jolted and mumbled something that led the friend to think all was OK between Dad and Jesus. I hope that story is not true. But knowing the person involved, I suspect at least elements of it are true. One summer while in seminary, I did a chaplaincy internship at the University of San Francisco Medical Center. Creed was not emphasized. Personal presence was. Being attuned to the patient was. In my humble opinion, even though Dad was on a quest related to his faith in his last years, who he was and his beliefs were not consistent with what his friend was pushing, and it was inappropriate to do that kind of proselytizing at one's death bed. Even a conservative Christian could have confidence in simply being present and trusting a higher power, known as God to some people, to be present as well. In the few words I said while visiting him, my emphasis was, "Dad, you are in safe space. You don't need to hang on for me. You can let go. I will be OK. I love you." Dad was at Mary Greeley for 10 days then went to Israel Family Hospice House, also in Ames, at 4 pm on a Wednesday and was found dead around 9 am the next day–July 1. I also vividly remember his relaxed countenance in his bed when I went to his Hospice room a few hours following his death. After the Hospice chaplain led a few of us family members in a ritual around Dad’s bed, I rode my bicycle back toward campus on a trail through a park in Ames that I had never seen before. The park and the weather were idyllic. I wanted to linger, soak it in, and meditate. I also wanted to keep moving. Then I did the mundane. I stopped at Hy-Vee and had two pieces of pizza–food I seldom indulge in, but I wanted nurturing food. I also stopped next door at Goodwill and looked through the men’s medium and large, long-sleeved, 100 percent cotton, plaid shirts. For the past few years, ever since I began checking them out for gardening shirts, they have been a staple of my wardrobe. I found one I love–slate blue with white lines–and wore it home. Later, I realized the shirt was not much different than one I remember Dad wearing, along with one of his string ties and Ivy League hat, when I photographed him at the farm several years ago. Since 1999, when some of us started this Rolfe alumni web site, there have been many deaths and obituaries to post of Rolfe people. There are probably thousands of stories and perspectives about what those deaths have meant to those people left behind. But in the case of my father, he was just that–he was my father, so his passing was huge and has hit close to home. He must have also meant a lot to other people, considering that over 500 visitors have checked out his obituary in our memorial board section–many more visitors than for any other obituary. It is interesting, within a family, how the attitudes toward and memories of a patriarch (or matriarch) can vary. In our family, there is at least one sibling with unfettered adulation for my father as expressed on her Blog. That is not my perspective. Instead, I have mixed feelings–both positive and negative–regarding him. I also have mixed feelings about the power dynamics among us siblings, and it is still hard to let go of my deep resentments about some of the ways in which those dynamics played out in recent years, especially a year ago–and in particular at our first gathering of nearly all siblings after Dad died. As I write, I realize there will be readers who wonder why I allude to differences within the family and some of our tensions. That certainly is a good question. In some regards, maybe I write this in order to give voice in a way that I could not do while the family was gathered, considering that I am not in the inner circles and feel like my voice is nearly a minority of one. Perhaps that should not be the fodder for a public essay. In some regards, though, I present this as an example about family dynamics and personal, emotional health in the face of death and the grieving process. Just as no two people ever step into the same river, no two people ever enter the same family. A river is always changing. A family is always changing. It is natural that people within the same family would have different perceptions, not only of the family, but of the patriarch and matriarch. It is also natural that people have different ways of dealing with grief. Although my father was a resident of the Hospice House for less than 24 hours, I have received (and I presume my siblings have received) follow up letters. They come about once a month. I realize that the letter writer, probably a grief counselor or chaplain, is well-intended, but there often is a statement that is so general and suggests that everyone is "missing" the deceased "loved one" with no acknowledgment that some of the survivors might not being "missing" the person or may have mixed feelings related to that person–perhaps not even fully loving him or her. I suspect that the author of the letters knows that grief is more complex. But even so, I wish the letters were not such a gloss and would acknowledge that there could be and are a variety of reactions to the death of a family member. I recall Elizabeth Kubler Ross and her book, On Death and Dying, written in 1969. It outlined five stages of grief. I suspect that it was the first research and book on the topic, and her work, which became quite popular, was misinterpreted to mean there is a definite, linear process that all people go through when someone important to them dies. Although many older people in my life (grandparents and great aunts and uncles) died when I was young, I did not encounter much in terms of death of friends or family members until the last couple of decades. My mother’s and father’s death have certainly put me more face-to-face with death than ever before. I recall following the white Powers Funeral Home van, with my mother’s corpse in it, to the Wilbur Burial Vault Company in Fort Dodge where she was to be cremated. After arriving there, the driver unloaded her cardboard box onto a transport table. I hesitated, thinking my request might be inappropriate, but I asked him to lift the lid so I could have one last look at her before she was rolled into the retort to be incinerated. She was dressed only in her nursing home gown. I then left while the box was still on the cart. Being there was neither a pleasant nor easy experience. However, I had once read a book by Natalie Goldberg, Wild Mind: Living the Writer’s Life (1990) about the death of her Roshi (master) at a Zen Center in Minneapolis where she had lived. The Roshi had died, but people kept vigil with him, not only in his last days of breathing, but with his body while it was awaiting cremation and when it was placed in the fire where those keeping vigil experienced a sense that his spirit had finally been released. I had often thought about Goldberg’s experience, and as Mother’s health turned for the worse at the Rolfe Care Center, I called Powers Funeral Home in anticipation of her impending death to find out what steps they would take after somebody died at the nursing home and what the options were for me doing something akin to vigil that the Roshi’s followers had kept for him. Little did I know she would die the next day. I was glad for the cooperation of the funeral home staff and the opportunity to accompany her body to that final destination and be close to the reality of what was happening. In many ways it was liberating. I think of the mythological firebird, the Phoenix, that rises from the ashes of its old self. In the 1980s, at San Francisco Theological Seminary, a Presbyterian school where I earned my Master of Divinity degree, I took some courses on death, dying, and grief. Even so, I do not understand grief except to say that it can be mysterious, affect a person in unpredictable ways, and be different for different people. Also, there is power in embracing death and not denying it–and wisdom that can be found in honoring grief and negative feelings rather than splitting off from them. For a number of decades, perhaps since the time of working with a therapist in the 1980s, I have realized that I still have deep grief regarding my grandparents, John and DeElda Gunderson. He died in 1956. She died in 1964. I sometimes think I am past becoming emotional on the anniversaries of their deaths–especially Grandpa’s. But then October comes again, and I grieve his loss again. I sometimes think that I have completed my grieving related to my father’s death a year ago, then I find myself choked up and lamenting the complexity of feelings I have for him and the unresolved issues between us that went to the grave with him. 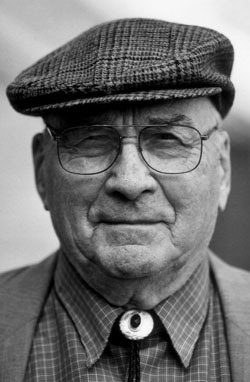 Some of my perspective is unfettered adulation that I had for him (and my grandfather) when I was a child and looked up to them and their way of farming. Some of the feelings, though, have to do with frustrations about his style of discipline when I was growing up and frustrations I had relating to him as he aged. Perhaps, just as many schools now require students to take parenting classes, there should be a movement to teach people how to be compassionate toward aging parents, especially when they regress in some of the reasoning abilities. Example number one was Dad’s insistence of being able to continue driving a car and the family’s inability to reason with him. Example number two had to do with his hearing and how he could easily hear what one sibling said and how he could barely understand what I would say even though I tried to talk slowly and articulately. Often, though, in my attempts to have him hear me, I would speak louder–so much that it sounded like I was yelling at him, and I felt embarrassed. The disparity in his hearing caused me to feel he did not value my perspectives and had favorites among his children even though I understood that some of my siblings had higher pitched and more tonal voices than my flat voice. And there were other frustrations that I need not mention here. As I write, I have a sense of equanimity. I am pensive as I choose my words. I am not choked up. But as I said earlier, grief is mysterious in the ways it works on a person and its timing. I can not predict what future course my feelings will take. Perhaps some day, enough healing will have transpired that I can be more understanding and compassionate regarding Dad and the power dynamics within our family and how some siblings behaved in recent years. But enough for now along that line of thought except to suggest that readers be kind and nurturing to themselves in the face of death and grief and know that they do not have to be perfect. Yes, forgiveness is an important part of healing, but it is not something that can be forced. In relation to my father, my feelings are not just about his demise but how his passing is part of an era that is passing. My great grandfather and great grandmother (C.L. and Dena Gunderson), then my grandparents (John and DeElda), then my parents lived on farms, and the men were to be farmers. That farming heritage has ended. None of C.L. and Dena’s descendants live on a farm. That includes my five siblings and me. We have inherited land and receive substantial farm income, but that is not the same as being a true farmer. I am a little smug, however, and call myself an urban farmer. 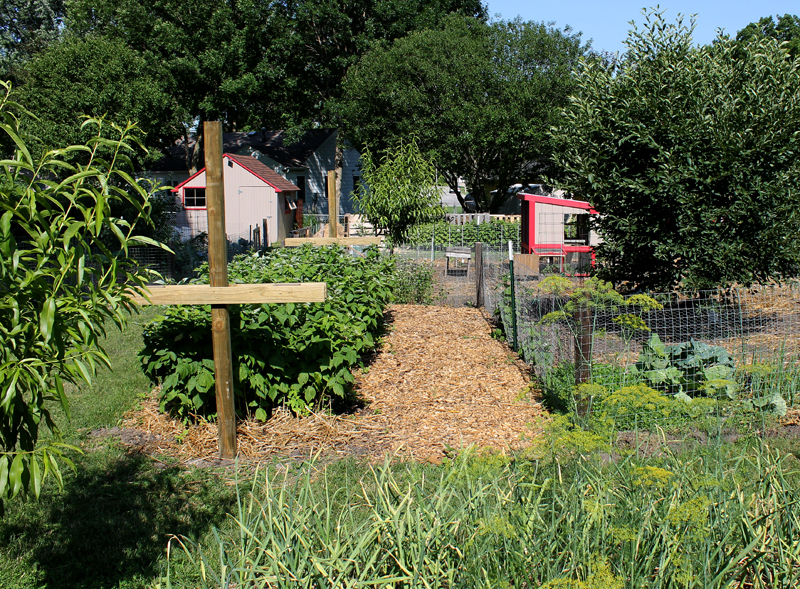 I have a third of an acre lot with huge garden, fruit trees, prairie patch rain gardens, and two flocks of chickens on Burnett Avenue in Ames. This spring, another era-ending event happened. 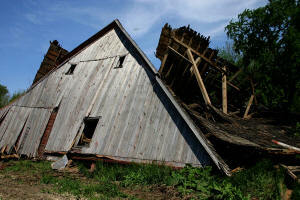 The Gunderson homeplace barn was razed. The homeplace is the farm half way between Rolfe and Pocahontas that C.L. and Dena established, where my grandparents lived, where my father was born, and where I spent precious days with Grandpa and Grandma. As a middle child in a family of six, it was neat to visit them and feel like an only child. In 1990, I was at the homeplace and videotaped and photographed Alan Branhoij and a colleague tear down the Victorian house that had been built in 1907. They were able to recycle most of the materials. 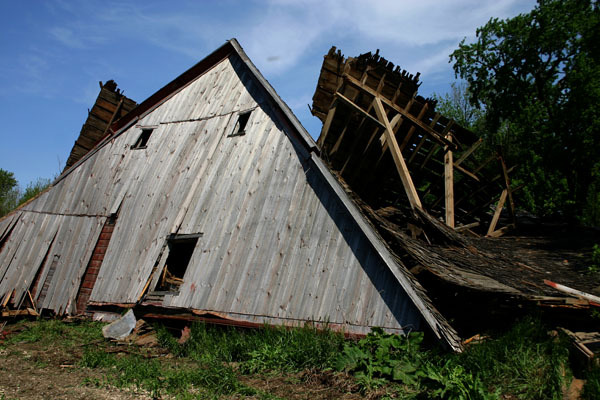 After their work was complete and the site had been bull-dozed smooth, I anticipated that it would be a matter of only few years before my brother Charles, who owns the farm, would arrange to tear down the barn. However, years went by, and it continued to stand. I guess he delayed because he felt I had an emotional attachment to it. Well, yes, the homeplace barn has been an icon that has held a lot of meaning and memories for me. On the other hand, I have been ready for it to come down and be able to videotape the process. In January, Charles let out bids for the deconstruction, and Alan got the job. But it took months before a date would emerge when Alan was available to do the work, I could make arrangements to be at the homeplace, and the weather would be right. But the day came. It was beautiful with perfect lighting and little wind–perfect conditions for getting good video footage. What were my feelings? Mainly ones of joy. Yes, poignancy and memories surfaced, but it was time for the building to go, and I was glad I could be there with camera. 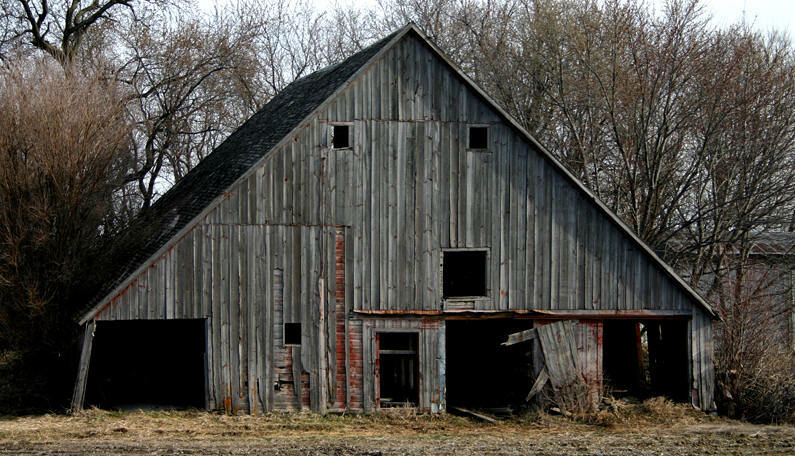 Some people wince when they hear that a barn is to be torn down, and in some circles, that is not a politically correct thing to do. But this barn had seen its day. No one lived at the homeplace. Seldom was a soul there except perhaps to park a tractor and corn planter or pay homage to our heritage by climbing around in the barn. It was not being used for anything except as a repository for used seed corn bags that my brother’s tenant piled there. Family members and other people had already picked over the exterior and interior wood. The rafters were rotting. The haymow floor was slumping. Fortunately, I had been able to visit the barn several weeks earlier with friends Gary, Betsy, and Luke Dahl who helped me remove two large pieces of wood from the feed bunks in the horse stalls. 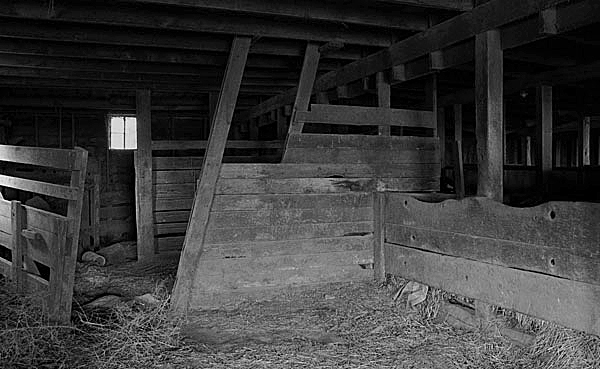 The wood was thick and old–the barn built in 1904. The wood was also well-worn and curved on top from generations of horses, including many Percherons, rubbing their chests (and supposedly, their hearts) against the wood. And there were large holes where halter ropes had been tied to the feed bunks. I brought the wood and a pulley from the haymow back to Ames. I had envisioned having a woodworker craft the wood into at least one beautiful piece that I could put on my wall to be functional, such as having a rack for my cast iron skillet, or to be a simple aesthetic and nostalgic piece of art. But when I got home, I had mixed feelings. Did I really want that wood as a reminder of the barn in my house and so easily in my face, reminding me of my heritage? I have bought time and secured the items in a storage unit, waiting until remodeling here is completed, to discern what I want to do with them. There is much I love about my heritage, but as much as I am proud to carry it with me, I also want to grow beyond it. Not only did Alan and his son knock over the barn with their large backhoe, but they dug a long trench. It was 18 feet deep, 12 feet wide, and the length of the barn. First they dumped large trees into it then piled on wood and rubble from the barn, poured on diesel fuel, and lit a match. It was a beautiful, raging fire with sparks blown by a strong wind. It lasted into the night and next day. Charles and his wife Gloria and I had an impromptu picnic that evening as we simply hung out and watched the flames, neither in a hurry, nor exchanging a lot of words, but taking the experience in. I had brought a cooler of deli food from Wheatsfield Coop in Ames that I had intended for my own use while visiting the Rolfe area. Instead, I parceled out the food. We had no picnic chairs, table, plates, silverware, nor even napkins–not even a blanket to sit on. But we were content and well fed. Charles and Gloria didn’t even seem to mind the sweet and spicy, grilled tofu I had brought. However, Gloria and I were the only ones who tried the pickled beets. Neither tofu nor beets have ever been common menu items for the rest of my family even though they are common for me, and I pride myself in making pickled beets. I fondly recall taking a jar of them to a meal at the homeless shelter in Ames and having one of the men say that the beets were "to die for," and another of the men whole-heartedly agreeing. It would have been neat, that night as we watched the rubble of the barn burn, if we had brought graham crackers, marshmallows, and Hershey chocolate bars. I suppose Alan could have scooped up a small portion of the huge fire and put it in a bowl or other container for us to roast the marshmallows and make some-mores, but that was not the case. In many ways, that night and that fire were better than any last-night-at-camp bonfire than I ever participated in, and just as great, if not greater, than any solstice parties I have attended. It would have been neat, also, to have camped overnight at the homeplace and kept the fire company. But we did not. I stayed at my parents’ farm house by myself for the first time in years–a strange feelings with many furnishings that had already been removed and many accessories that were still in place as if nothing had changed. I returned to the homeplace late the next morning. Alan and his son were there but soon left for a lunch break. I walked around, took a seat in their Bobcat skid-loader at the edge of the ruins, meditated on the scene before me, and watched a huge skunk scamper across the rubble. I suppose she had been living in the rock, concrete, and dirt floor. Later, Alan told me that a baby skunk had been crushed by a falling rock during the morning’s demolition work. Presumably, the mother skunk was looking for her young and mourning her loss. I got out of the skid-loader, walked back and stood by the trench, watching the dwindling flames. Again, the image of the mythological Phoenix came to me. I also think about all the solar and other energy bound up in a prairie and how a good prairie fire releases tremendous energy. It was time for the barn to burn and for its energy to be released. As much as I love that place and am drawn to it, I was ready to let it go and be able to move. I suspect that of all of us six siblings, the homeplace barn has meant the most to those of us who were old enough to spend time there with Grandpa, watching him milk the cows, enjoying the cats, and being around the horses. One of my best memories was that of playing in the haymow, grabbing a hold of the hay sling rope, being pulled across near the rafters, then falling into a large pile of hay. The memories don't get much better, but they ended when Grandpa died in 1956. He suffered a stroke one afternoon during corn harvest, was rushed to the Fort Doge hospital and died during the night. I had not known anything was wrong with him and first learned of his death when there was a knock at my sixth-grade classroom door, and I was asked to come to the principal's office. Mother was there and told us school-age siblings the news. Grandpa was 69 when he died on that October day, I was 11, and the youngest sibling was nearly a year old. Grandma died in 1964 following a long decline due to breast cancer and related complications. She was 71. Now that I have video footage of razing the house and barn at the homeplace, I want to edit a video about the place. But that process will have to wait until next winter when there is no gardening to occupy my focus. I anticipate that when I do produce the video, I will experience a range of feelings. But for this week, what bubbles up from my subconscious has more to do with memories of Dad’s death a year ago and reflecting on my own mortality and priorities. People do grow older, even we who graduated from Rolfe High School. I am in my Medicare years. In some ways, that is good. I did not have to pay a penny for my recent colonoscopy with a bill of more than $3,000. (Of course, though, I paid a ton of money for my health insurance policies.) Mary Greeley Hospital, site of the testing lab, is only seven blocks from my house. Even so, I decided it would be unwise to bike there, and I knew the hospital would not let me walk or bike home. So arranged for friends to give me rides. Fortunately, after my annual physical exam and related tests, I have a clean bill of health except a couple of small concerns, including elevated cholesterol levels. However, that does not mean there is no cause for concern. On the surface of appearances and not a serious matter, my brown hair has more silver-gray specks and streaks and has become coarse, making it more unmanageable than ever before. My chin sags. My memory and ability to focus are softer. I have always valued being physically adept, but my the strength in my knees is much diminished and it is hard to rise to my feet after kneeling on the ground to for an activity such as planting marigolds and peppers. Fortunately, though, I am capable of riding my bicycle almost any place in Ames–including pulling a trailer loaded with such things as bags of cow manure from Earl May Nursery to my home–and do not need a car for urban travel. I try not to dwell on aging, but it is hard to ignore, and it seems wise to look ahead and be prepared. While having some remodeling done this year, I had the workers widen the bathroom door from 27 inches to 31 inches (the widest it could go) in case I ever need to use a wheel chair or walker. And this house, which I bought in 2006 after many years of living in an apartment, is very user-friendly with only two steps to get to the front door and a washer-dryer on the main floor and not in the basement. When I think about mortality, whether my demise will be at the age of 75 like the death of my friend Mary’s mother or at the age of 91 like my father, it seems not all that distant. Then comes the question about how I want to use my time. What are my priorities? What should I detach from? I have valued being the instigator for the development of this web site and editor for the nearly 12 years of its existence. It has been a great way to learn web site skills, use my audio-visual skills, share my writing, be part detective in digging up information to put pieces together for a posting, and connecting with people. It has also been an asset to be part of a family with four generations of connections to Rolfe and Rolfe High School. I am proud of what has evolved with the site since it was first published in November 1999. That is not to say there were not frustrations. But do I look at the cup as half full or half empty? On one hand, it seems awesome that 60 people have written essays for the site. On the other hand, I initially thought a lot more people would like to participate, and I had to deal with disappointment before letting go of my grand expectations and seeing the cup as half full. Much has happened in terms of technology over these many years. I can now sit on my couch with my feet on a cassock with a laptop on my lap to write and a cat beside me. In the early years of the site, this kind of work had to be done at a desk with large CRT monitor. Initially, the site could handle only about five megabytes of material. Now with improved hard drives, it is probably nearly 300 megabytes. By the way, thanks to Randy Martin for providing the space, technical help, advice, and friendship. YouTube now exists, and I can easily post videos to it, and visitors can easily watch them. To think of the possibilities is simply mind-boggling. I first started taking home movies–Super 8 format–in the late sixties. The film and processing were costly. Each cassette held only 50 feet of film and lasted for only 3 ½ minutes. I used a razor blade and splicing tape for editing. What a chore, and the film could easily get scratched or chewed up in a projector. But now. Wow. That same footage can be transferred to a digital format, easily edited with no further degradation of the image, and seen around the world on YouTube. Of course, by now, some of the ways that this site is set up are archaic. The format works for me but has little in terms of modern features such as Facebook, Twitter, etc. And there is no automation. Take for instance the memorial board section. BTW, thanks to Chris Simonson for his willingness to maintain that page, his listening ear, advice, and friendship that have grown through our work on the site. His has been a manual, cumbersome job to post each obituary and make the necessary hyperlinks. Even Chris, who has been loyal to the work, has felt the grind and lost enthusiasm for the work. Hopefully, in the future, there were be a way to automate the memorial board section. I feel like the RHS site, in its current state, is akin to a pile of old National Geographic Magazine sitting next to the toilet at an Okoboji cabin, meaning that some great material is archived and accessible. However, in discerning my priorities, I no longer want to be responsible for it. Yes, I may eventually post a new YouTube video (such as great Rolfe High School footage I discovered from the 1970s or the video I plan to produce about the homeplace barn) and send the link to it to Randy or Chris to announce on the What’s New page. Or perhaps I will write another essay. But I want to be done with being in charge or otherwise having a significant role. I have talked with Randy and Chris. We all know that my resignation as editor might mean the demise of the site. None of us knows of anyone else who will be willing to do the work. And I am not sure who has Web site skills that I would trust to adopt the site. We also understand that the Web site does not have to keep up to the standard that I set. Perhaps in the future, the parts that I developed will be archived, and the only dynamic sections would be the what’s new page and memorial section. Perhaps someone would be willing to join Chris in maintaining those sections. And perhaps fans of the web site would be willing to donate funds so that Randy can hire staff to redesign and automate the memorial board. But those will not be my decisions to make. A few years ago, it would have been hard for me to let go of my role as editor. But the sand moves through the hour glass, events happen, endings happen. I get nearly overwhelmed when I think of those things I want to do: edit a video about the homeplace, wrap up aspects of my documentary project about the road I grew up on, produce additional YouTube videos from my archive of home movies and videotape footage, conduct video interviews for my church, be an advocate for sustainable agriculture and the use of locally grown food, work in my garden and tend to my three older and five younger chickens, enjoy my four cats (and keep them fed and their litter boxes clean), take naps, go for bike rides around Ames, get back into practicing yoga, resume making bread, pickles, soups and other great food now that my house remodeling is (nearly) done, make calico napkins, have guests here for meals, enjoy meals with friends in their homes and at cool restaurants, and organize meals at my church. More importantly, I want to be centered and feel at home in the world in the midst of the desire to do at least a few of these things. I am a great declutterer. When there is a shirt in my closet that I have not worn in three years or an item in a drawer or on a shelf that is dead weight, I get rid of it either by thinking of a friend who could use it, posting it on Freecycle, taking it to Goodwill or Salvation Army, otherwise finding it a good home, or putting it in the trash. And once I have made a decision that I no longer want something, I am impulsive. Perhaps I am impulsive in ending my relationship with this site; however, I have not found a good home for it except to turn to Randy and Chris, tell them my interest in resigning, and trusting that if it is to be kept alive, they and others of you will find a way to do so. I don’t know how this exactly fits in, but I would be remiss in closing if I didn’t mention something really cool that happened last week. On Monday, the day after the one-year anniversary of my father being brought to Mary Greeley Hospital, I was at a low ebb in terms of energy and mood. I was grieving the unresolved issues between the two of us, overwhelmed with all the work in my garden, and frustrated that there were so many remnants of remodeling left to be done here. Also, I was extremely tired, from lots of bike riding and gardening, and had a tight muscle in my foot. All I wanted to do was sleep late, eat, then nap. Fortunately, I had enough energy to make hair cut and chiropractor’s appointments for the next day. They went well, then I headed for my favorite place to eat–Wheatsfield Coop. I initially sat at a table, enjoying a cold drink, then noticed a weird-looking troupe of adults in capes. I thought they perhaps were part of a theater group. 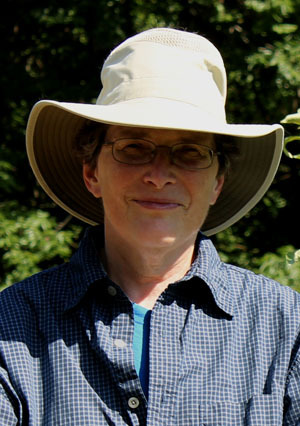 Then, as I headed toward the deli, a friend, Alice, who founded Mustard Seed Farm that operates on the Catholic Worker model about 10 miles north of Ames came to me and asked, "Hey, Helen, how big is your yard and is there room to pitch 12 tents?" Apparently, the characters in the weird-looking, caped troupe were "Super Heroes" and part of a national association of that same name with some 600 members and in tandem with the Possibility Alliance based in St. Louis. A dozen or so of those folk from across the country and their bicycles had converged on Mustard Seed Farm the previous three nights for orientation and to help with farm work. They had then come to Ames, and thus, Alice’s query about my urban "camp ground." By the time I rode back to my house, the group had already arrived there, pitched their tents, and were cooking supper at a cook stove they had brought on one of their many bike trailers. Let’s see if I can remember their names: Zing, Infinity Man, Bright Sky, Fortidude, Beatidude, Split Second, Wander Woman, Love Woman, Super Stretch, Star Dust, Gitchi-Gami, Split Second, and Laughing Moon. They say, "The Fates take them where they are needed." That has meant 22 trips in the last 11 years in 26 states and three countries with a creed of aiding "those in distress." Both nights that they stayed at my place, I enjoyed their checking-in discussion as they sat around on my porch then had a time of gratitude–each telling what he or she had been grateful for that day. At six in the morning, some would rise to do yoga and meditate. At seven they would have breakfast. Then there was a circle in which there was a reading from Rumi or another poet, planning for the day, and maybe a mini workshop on some activity such as creating love bombs–perhaps leaving a cool message, written on a sticky note, on someone’s back pack on the bus. The Super Heroes were in Ames for one full day. Many of them pulled Creeping Charlie and put down a mulch of cardboard and wood chips to make a weed barrier around the edge of my garden fence. I rode across town to retrieve a pick up truck that my dumpster-diving friend, Toby, said I could borrow. Then Zing and Love Woman went with me to get more chips from the city wood chip pile. Zing chased after us on his bicycle, operating on principle and not willing to ride in a gas-powered car or truck. We finished one trip, then Stretch and Love Woman went with me on a second trip. Later, Split Second went with me to the Ace Hardware store to get pallets to make a new compost bin. Turns out he is a seasoned dumpster diver and has had plenty of experience with pallet duty following farmer’s markets in the heart of Boston where he lived for 11 months in an area that he found to be comfortable and secure between a set of buildings on three sides and a brick-lying construction zone on the fourth side of his makeshift home. Although I am rather an introvert in certain regards, and having so many people here for so long of a stretch of time was a challenge for me, I loved every minute of their visit. I appreciated the gentle way that they respected each other, had little in terms of an agenda but lived in the moment, served without judgment, and went to places such as the Emergency Residence Shelter to help for the day. They planned to ride next to Tabletop Farm near Nevada to help, then perhaps to Marshalltown and Collins where they had heard there were people in need. Then they wanted to see what help was needed in Des Moines at the Catholic Worker House. I also liked the fact that there were no clear gender roles. Both the men and women cooked. Their emphasis was on organic and locally-grown food. Although much of the menu was vegetarian, they made an awesome soup for one meal, using three chickens I had in freezer from the Dahl family. They also made corn bread, grinding transitional organic corn grown by the Dahls. I wonder if there could ever be an alternative RAGBRAI ride (the annual bike ride across Iowa organized by the Des Moines Register), organized to go a shorter distance than the well-known bike ride across the state and for the riders to provide public service each day in one of the towns along their route. That would certainly create a different public opinion than the traditional RAGBRAI, which many people view as one huge drinking party on wheels. Of course, that is a generality, but I am wondering if there is any public service component to RAGBRAI. The Super Hero visit here was pure serendipity–something I could never have planned. Admittedly, although I admire the ways in which they live out the best of what religions teach about being of service and encountering the stranger, I needed a break to rest when they left and am not inclined to join their troupe for a ride. Although, probably, at a younger age, I would have liked to go on a short version of their trip. While they were here, I felt a great affinity with them. It was like having the best of a camp or retreat center experience but right here on my property. It was like being part of a new family even if I never see them again. During a ritual of thanks before they cleaned up the place and rode off on their bikes with capes flying in the wind, they talked about how thankful they were that I had developed my property into such a wonderful oasis where they could feel so at home. It was as though their presence, which was part of something bigger and more mysterious than any of us as individuals, was a blessing both for my place–what I have called my new homeplace–and for me. I am grateful for all the supportive people who have helped restore this house, build infrastructure such as fences and the chicken hotel for the yard, develop the garden, and teach me so many aspects of farming–for instance, the care of chickens and the art of grafting fruit trees so that I could have a clone of the 85-year-old Wealthy tree at the Gunderson homeplace to grow here. I am also grateful for the support of friends who have helped me feel at home during my life's journey, especially here in Ames and at this site on Burnett Avenue. And I am certainly grateful for the agrarian heritage and financial resources my parents and grandparents have given me that have allowed me to have this space where I can grow and engage with people–whether the likes of the Super Heroes, the mother walking past the front yard with young children who lets me show them my chickens, neighborhood folk who stop to talk about my Butternut squash growing next to the sidewalk, friends from church who come to pick raspberries or get rhubarb, friends who live out of town but work in Ames and need housing when they cannot get home during a blizzard and make their home here for the night, and others such as Ron, the neighbor across the street who just rolled a wheel barrow with boxes of canning jars and left them by my garage door. Last week, I had given his wife Mic a tour of my yard, and she said she was cleaning out her basement and wanted to give me canning jars that had been unused for years. I like this sense of community and family. I also want to keep open to serendipitous events such as the Super Hero visit and unexpected ways in which blessings happen. Song tunes have wafted through my mind ever since the Super Heroes arrived here. One is "Hey Jude" by the Beatles with an emphasis on the only lyrics I know from it, "Take a sad song and maker it better." The other is the hymn, "May the good Lord bless and keep you ..."
It’s been a short night, writing until about 4 am and getting up about 7 am to let the older chickens out of their hotel. It’s time for breakfast. I just gathered garlic scapes, a handful of asparagus spears, and some kale leaves from my garden. I will cook them in olive oil, add two eggs from my flock, scramble the mix, then add salt and pepper for my breakfast–all very local food with little environmental impact from miles of semi-truck transportation except for the oil and seasonings–and oh, yes, the whole wheat tortilla that I wrap around the egg and vegetable mix. When my house remodeling is completed, I will return to making my own tortillas with transitional organic wheat from the Dahl family that I grind. BTW, when I toured the garden, Lacy seemed spunky and in good health. Following breakfast, I will shower and dress in that blue, plaid, cotton shirt that I got a year ago and other gardening clothes. But instead of working in the late morning heat and humidity, I will probably catch some more sleep. Enough said. Thanks to those of you who have been loyal fans and occasional visitors. Thanks especially to those of you who have submitted material to post and have sent feedback. And a hearty thanks to my older sister, Clara, who has served as a reference librarian, proofed many pieces, and sent obituaries and news alerts for me to post. I am still part of the extended RHS community, but I am no longer your editor, and my focus is shifting. Be well.